Product #21264 | SKU E-HL10DS | 0.0 (no ratings yet) Thanks for your rating! 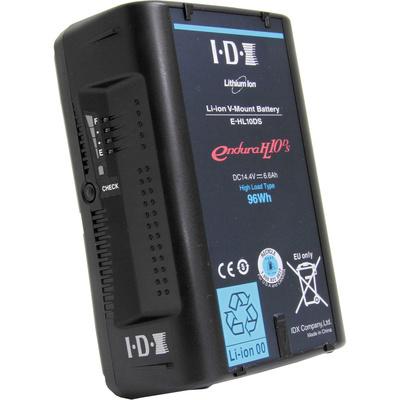 The ENDURA E-HL10DS 96Wh Li-Ion V-Mount High Load Battery from IDX can be used with all ENDURA V-mount chargers and accessories. With a 96Wh capacity, the E-HL10DS can handle a draw of 10A/120W. In addition, it comes equipped with one built-in D-Tap connector, which is capable of taking a 50W load to power ancillary accessories. The internal design of the battery pack cradles each cell securely to maximize safety. Weighing approximately 1.76 lb, it is suitable for high draw applications where weight matters.